The control of physics-based simulated biped locomotion is a hard problem because bipeds are inherently unstable and underactuated. In this semester thesis we intend to create a controller for a physics-based simulated biped character that is stable for various motion styles, walking parameters and unpredicted disturbances. 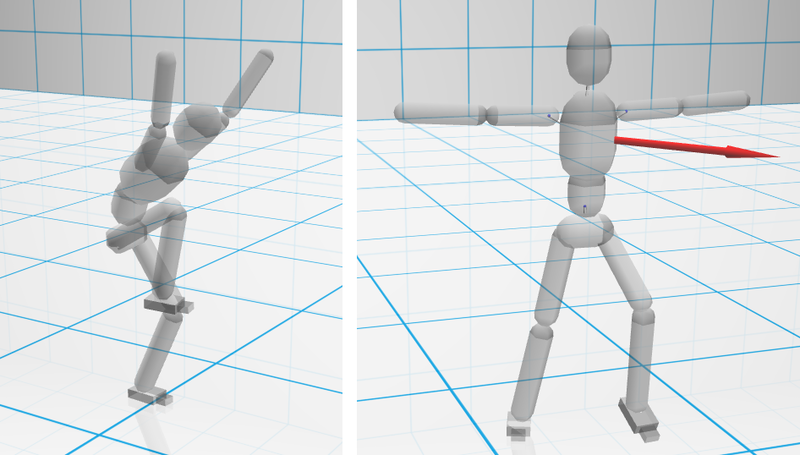 In a first step the user can design a desired motion by specifying a few target poses. The controller then tries to track the designed motion while maintaining balance. Furthermore, the controller allows to interactively control certain walking parameters and apply external forces on the character. The approach to this problem discussed in the thesis is to track the target motion using proportional derivative control, maintaining balance by computing the optimal foot placement through an inverted pendulum model and compensate for gravity and discrepancy from a target velocity by applying virtual forces through the Jacobian transpose method. The control of the walking parameters allows for forwards and backwards walking motions, various walking speeds and step widths and turning to change the walking direction. The controller is able to perform balanced locomotion for various user designed walking styles and walking parameters and is robust to pushes in all directions. The following video shows how the controller works and what kind of motions are possible and how the character reacts to its environment.